Slow and steady, I have reached the point where the studio is able to produce bits of work. One would be amazed at how much time it takes to vacuum, wire brush, tripoli buff, wipe down with a mix of paraffin and mineral spirits, machine oil pivots and screws every steel tool I have then sort out for sale the many I do not use. Then there is dust. Working in warehouse space with gravel driveways and roads means there is a fine layer of dust on everything and over 10-12 years it works its way into covered boxes. Add working with a few new 6 inch buffs and the dust is everywhere – cotton and dirt. After beefing up the collector on my buffing machine I built a cheap area dust collector and this runs on 2 when I’m in the studio. 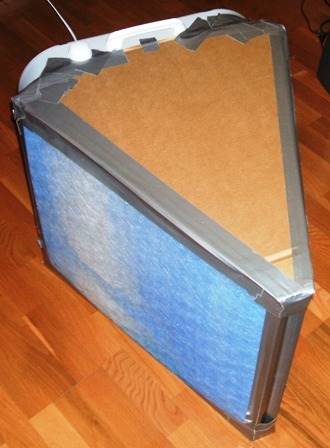 $20 – $15 box fan, roll filter media, cardboard, 2 pack clearance merv 9 filters 4.99 with duct tape. Note – I used two filters to increase surface area of intake so the resistance caused by the filter media would not place a greater load on the cheap fan motor increasing amperage draw. Do not place a single high merv filter on the face of the intake side of fan. The fan is 20×20 and the filters used are 20×25. I have seen many versions of this set-up on woodworking sites – not pretty but a nice addition for a workspace. combine in sealed container, shake until dissolved, wipe down entire tool, spirits evaporate leaving micro layer of soft wax. Wear appropriate PPE – ventilation, nitrile gloves and glasses. When I grab a tool I would rather feel/see wax than rust. For those who are worried about the wax film contaminating metal all cleaning processes done before soldering, heat and quench, for instance, remove this wax along with other dirt/grease. This entry was posted in jewelry bench/shop ideas and tagged art metal, dust collection system, jewerly studio, metalsmith, rust preventer recipe, silversmith, tools, workbench. Bookmark the permalink. Thank you for sharing this setup for dust removal. I have built one to help reduce the fine dust as we are finishing our new passive house and before we hookup the HRV. It is working great! Do you guys think this could handle MERV 13? Even higher? It depends on your fan. If the filter restricts too much air flow the motor draws more amps. Measure the amperage as you cover the fan intake. When you have sufficient surface area of merv#n(whatever) matching the spec amperage draw of the motor then, yes, merv 13 could work. Every fan is different, every enclosure is different, surface area, fluid pressure, turbulence, etc. That’s why I basically doubled the surface area of the original fan in the post. Don’t just slap a high merv filter on any old fan – you’ll burn up the motor and you won’t get circulation to catch the particles you are trying to capture. 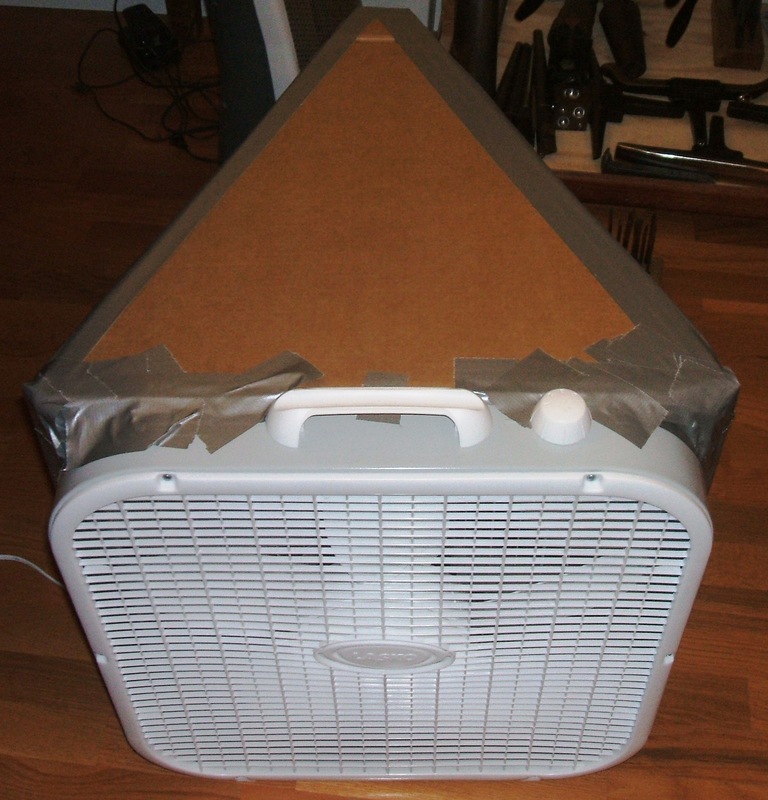 With the original set-up running almost 24-7 I replaced a Home Depot box fan ($20) every year. I also ran the ceiling fan all of the time. This allows and forces particles to remain airborne until they reach the negative pressure of the filter fan sitting near a side wall of the room.